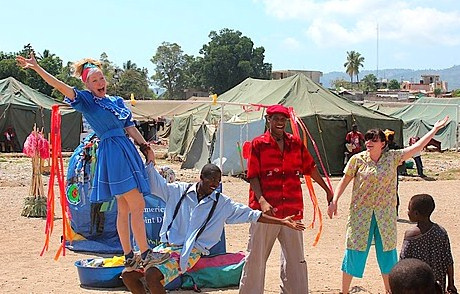 Bond Street Theatre performers and Haitians stage the hit of the season in a camp in Port-au-Prince. While quake-shattered Haiti still has many challenges ahead, the road to recovery has already been speckled with creative initiatives to help mend the lives of those affected by the disaster. With JDC support, members of the Bond Street Theatre (BST) company recently traveled to Port-au-Princeto develop the Theatre for Social Development: Haiti program. BST’s unique model, specializing in non-verbal street performances, has garnered social improvement and positively impacted the well-being and life skills of children and in crisis-hit communities in South America, Israel, China, Indonesia, Pakistan, India, Myanmar, and beyond. We’re proud to say that JDC has previously supported BST’s work in the Balkans! This stop: the tent camps of Port-au-Prince. The three-week initiative in Haiti included performances and workshops for the displaced people living in these camps. Bond Street took their proven success in alleviating stress of victims and displaced people and this time honed their focus on issues facing women and girls in the camps, helping them craft a new show about the earthquake and its aftermath. Applying theatre-based methods toward post-crisis healing and empowerment and as a means to community education and development, the troupe created a performance based on a Native American folktale about a community joining together to overcome an obstacle. The initiative reached over 1,500 children and adults living in camps throughout the city! BST also trained local trainers (Haitian educators and community artists) in their special approach to communicating social, political, and environmental issues with imagination, ensuring that even after the curtain falls, the shows and the healing will continue.